Can I drop ship a Sample pack to my client? Yes. You can drop ship a sample pack order to your customer. Can I request a Specific Sample that is not listed in the Unbranded Marketing Material Sample Pack? Yes, fill out the Form on the Contact Us page https://www.colortradeprint.com/contact_us.html with the sample product request. If Color Trade Print has samples of that product, we will mail you these samples and provide tracking information to ensure you receive the requested samples. Can the Sample of your completed Job that I order be used as a Proof? No, this is NOT a proof of your order and it will be shipped directly to you at the same time that your completed order is shipped. This type of sample is typically used to archive your work or to build a portfolio of printed samples. We do not offer physical proofs before placing the actual print order. However, Digital PDF Proofs are available to add to your order during the ordering process. Simply click the button "Yes", send PDF Proofs. How does a Sample Pack differ from the Sample of a Completed Job? Sample Packs contain unbranded samples of products that Color Trade Print produces. They can be used for marketing purposes to show your customer what the products will look like after completion. The Sample of a Completed Job can be purchased for an additional fee at the time of placing a regular order. This is a completed sample of your job. How do I order Sample packs? Can Color Trade Print Drop Ship a package to my Client? Yes. We can drop ship a package to your customer. Simply select the option "Drop Ship" then input the new address or select an address from your Address Book. You will then have the option to input the ship from address. Please note that a Default address may be selected in the "Account" Category of the home page by selecting "My Profile" and opting to use the same Shipping address as the Billing address. No. Our system will only allow for you to input a physical address for your Ship to address. UPS and Fedex will not deliver to P.O. Boxes. Unfortunately, we do not offer that option.It is much faster for us to process your order via our accounts to ensure the fastest turnaround time. Does Color Trade Print offer a pricing or weight guide for shipping? We do not provide a pricing or weight list but you may get immediate shipping pricing on our website when placing an order. Does Color Trade Print offer Split Shipment on a Job? No, we cannot ship one Job to two different addresses. For example, if you order 500 postcards, we cannot split that order up and ship to two different addresses. You would be able to place an order for two separate Jobs and input the Ship to address for each Job. What type of files can I send to Color Trade Print? We recommend saving as a .PDF. You may also send the file in the following types: jpg, jpeg, tif, tiff, eps, and png. Remember to flatten your files before uploading. What color mode should by files be? What resolution should my files be set to? For all products in the Banners Category, we require a resolution of 150 dpi at 100% of the final print size. For all other print products, we require a resolution of 300 dpi and no less. Low resolution files may be printed as is or will be placed on hold until we receive new files, slowing your turn-around. How should I set-up my bleed? Bleed must extend past the cut-line and will be trimmed from the product during the final cutting phase. When the image is required to extend all the way to the edge, bleed is needed to preserve the finished look and the quality of the final product. Please keep all text at least 0.125" inside the cut-line. - The bleed for Standard Products is 0.125". 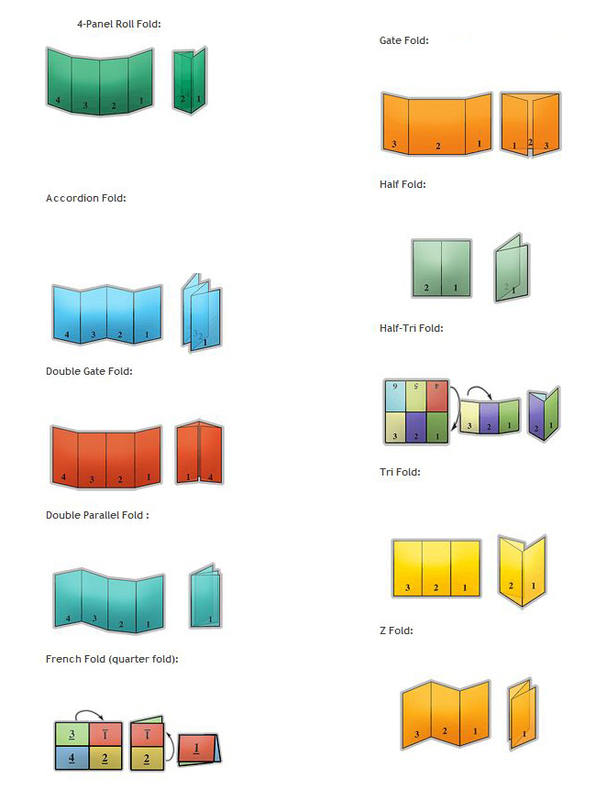 - The bleed for Booklets and Presentation Folders is 0.25"
Are Borders okay to be printed? Borders are ok to print but must be at least 1/4" wide and we suggest at least .5" away from the cut line. Please note that if cutting shifts then the border will be spaced apart on the different sides. Cutting can shift up to 1/16" on anyway. We cut through many sheets at a time, so watch your borders to avoid an unwanted mistake. Please make note: We are specifically set up to process one side at a time, and this requires that each side of a job must be on a separate file. Not separating files will cause delays and you might have to send the files again. Remember to separate the pages of your .pdf files as well. Can I submit the same File for the front and the back? Yes, you can. You will need to rename the other file so there is no confusion. Please note: this does not refer to uploading the front and back file together in file name "Front file". 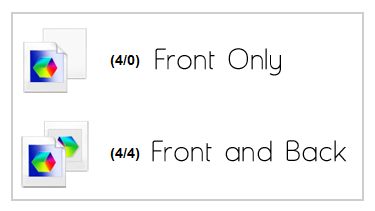 Front and Back files must be uploaded in separately. Do you guarantee Pantone Colors? No, we do not guarantee PMS colors for Flat or Full Color Raised ink printing. PMS colors are converted to CMYK. How do I achieve the Rich Black Color? What do I need to do to keep my Blue color Blue and not Purple? Please make sure that your blue color is 30% apart on the Cyan and Magenta. How does the Full Color Raised Printing work? Everything that is not white in your artwork will be Raised. You can bleed your image off the canvas if you choose to. We can only Raise 1 Side for Full Color Raised, the other side will be printed flat. Letterheads and Envelopes that are Full Color Raised must be 1/4" inside the cut line. We do not allow bleed on Letterheads or Envelopes. Why are light colors not compatible with Thermography (Raised ink print)? Why is 100% K only not campatible with Thermography (Full Color Raised ink) printing? 100% black prints a washed-out black color and thermo does not adhere to it. If you require a "Rich Black", then use the CMYK values (80, 80, 80, 95), which will result in a darker tone and improved thermography. How should I setup a Spot Gloss file? When creating a Spot UV job, you must include a Spot UV template file along with the regular print file. The Spot UV template file is used to show where the UV coating needs to be applied. For better quality we recommend creating mask files in vector based programs such as Illustrator or CorelDRAW. Please only use solid 100% K to indicate where you would like the UV. Do not use shadows, glows or grayscale images. White will indicate no UV. How do I setup Foil Jobs? You will need to make Separate Foil files for each side that will have foil. The foil file should be white where you want "NO FOIL" and 100%K where you would like the foil applied. Please make sure on your Original artwork files, that you do not have the foil parts where the foil will be applied. What is Inline Foil and How do I setup the file up? With Inline Foil, you can turn a wide range of CMYK colors into multi-colored foils. Inline uses a special processed foil system that is applied under a 4/c process to create an array of foil colors. For an Inline Foil job, you must include an Inline Foil mask file along with your CMYK file. The mask file indicates where the Inline Foil will be applied. The file setup is the same as Spot UV. Use 100% K where Inline Foil needs to be applied and white where the Inline Foil is not applied. What is the Difference between Inline foil and Foil Stamped? Inline foil makes any color you want turn into a metallic foil looking color. Foil stamp is actual foil stamped on to the card stock. What is the Size of your Round Corners? If I choose Two Round Corners, which corners will be cut? For horizontal layout business cards the Top Left and Bottom Right will be Cut. For Vertical layout the Top Right and Bottom Left will be cut. How do I keep my cards from chipping around the edges? This usually occurs with really dark blacks or heavy colors. Please use only offset pressing when using dark colors to avoid this issue. When Scoring, will my Job Crack in the Middle? We recommend not using a UV Coating when Scoring a job. UV Coating is the most common problem for cracking. What are 20pt C1S Business cards? 20pt C1S business cards are printed on a card stock that is pre-coated on one side and uncoated raw on the other. The coated side of the card stock will allow the colors to be more vibrant while on the uncoated side the colors will absorb more. Uncoated card stocks absorb ink more than others and are great for stamp cards, appointment cards, or other material that needs writing on. What font, size and colors will be used for the Variable Addressing portion? The Variable Addressing portion has a default font of 12pt Arial, black only. note: if your csv data file contains extremely long names or addresses, the font will automatically be resized to fit the addressing area, but will be no smaller than 9pt type. What if my CSV data file has less records than the run size I ordered? If I order a run size of 500, but my data file has only 450 addresses, will I get the additional 50 envelopes printed with my artwork? What if my CSV data file has more records than the run size I ordered? If your data file contains more records than the run size you ordered, you will be notified and asked to either upload a revised CSV data file with less records or you will be asked to cancel the order and place a order for the next available run size higher than the number of records. Will Color Trade Print modify my csv data file to correct any errors or typos? No. Color Trade Print does not proofread nor flag or correct errors. It is your responsibility to double check and ensure the validity of your data. Invalid addresses, typos, misspellings, inaccurate zip codes etc. are not the responsibility of Color Trade Print. Can I add and save my Clients addresses online for future orders? Yes. When logged in, under your Address tab on the top right of the homepage, the Address Book link will allow you to save all of your customers addresses. The addresses can then be accessed during the ordering process by clicking the Drop Ship button. No, we only offer EDDM Printing at this time. When logged in, under "My Orders" Tab on the top right-hand side of the homepage, you will be able to view all orders and select the reorder icon under the Order information category for that order. Please note that the same artwork file(s) will be used for the reorder, all order specifications will stay the same, and shipping details will not change. If you need to use new file(s), change order specifications, or change the shipping details, a new order will need to be placed. How do I sign up with Color Trade Print for a Wholesale Account? The first step would be to create a re seller account. You can sign-up here, https://www.colortradeprint.com/sign_up.html You must be a designer or reseller to be approved. We just require that you provide us with a Company name, a Company website and/or the Tax ID/Re-seller ID. Once approved, you will be able to view pricing and place orders. If I have a problem with my received order what should I do? Please fill out a Complete Job Trouble Ticket on our website, https://www.colortradeprint.com/trouble_ticket.html This is the quickest way to alert our Quality Assurance team of any concerns. Is my Credit Card information safe and secure? Yes. All transactions on the site are protected with up to 256-bit Secure Sockets Layer encryption via Go Daddy SSL. May I send my payment for my order via mail? We only accept Credit card payments or Paypal payments through our secure Color Trade Print website. What browsers work best with your website? What if I have a Job that I am not able to find on your website? What if I have an issue with a Completed Job? Please go to http://www.colortradeprint.com/trouble_ticket.html to submit a ticket for this order. Please also take some pictures showcasing the issue, if the product has been received. This will go to our Quality Assurance team that will assist you as fast as possible to resolve the issue. When logged in, under "My Orders" Tab on the top right-hand side of the homepage, you will be able to view all orders as well as the order status.